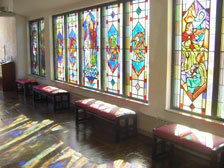 Saint George's has 48 stained glass windows in the narthex, chancel and nave of the church. To read more about a particular window or view a larger picture, click on one of the thumbnails below. When these pages are complete they will include an historic background of the scene, biographical information about the subject of the window, notes on the symbolism portrayed in the window, and questions for personal reflection. For a virtual tour of the entire collection, begin with the Thomas Cranmer window and follow select "next window" at the end of each text. The Narthex is the vestibule leading to the nave of a church. These windows are in the pattern of an Orthodox iconostasis, the screen that separates the nave from the altar in an Orthodox church. Christ is always at the center surrounded by the four evangelists. The icon immediately to Christ's right is always the Blessed Virgin, and to her right (and always closest to the door of the church) an icon that identifies the church (in our case, St. George). The icon immediately to Christ's left reflects the nature of the congregation (the hospitality of Mary and Martha), and the icon to the left of that links to the local congregation to the greater church (Archbishop of Canterbury, Thomas Cranmer). Have mercy upon me, O Lord, whose property is always to have mercy; for although my sins be great, yet thy mercy is greater. And I crave nothing, O Lord, for mine own merits, but for thy name's sake, that it may be glorified thereby. And Mary said, "My soul magnifies the Lord, and my spirit rejoices in God my Savior, for he has looked with favor on the lowliness of his servant. Surely, from now on all generations will call me blessed; for the Mighty One has done great things for me, and holy is his name." "Do not think that I [Jesus] have come to abolish the law of the prophets; I have come not to abolish but to fulfill. For truly I tell you, until heaven and earth pass away, not one letter, not one stroke of a letter, will pass from the law until all is accomplished." Behold, we go up to Jerusalem; and the Son of man shall be delivered unto the chief priests, and unto the scribes; and they shall condemn him to death, and shall deliver him to the Gentiles: and they shall mock him, and shall scourge him, and shall spit upon him, and shall kill him: and the third day he shall rise again. And the angel said unto [the shepherds], "Fear not: for behold, I bring you good tidings of great joy, which shall be to all people. For unto you is born this day in the city of David a Savior, which is Christ the Lord." In the beginning was the Word, and the Word was with God, and the Word was God. The same was in the beginning with God. . . . And the Word was made flesh, and dwelt among us, (and we beheld his glory, the glory as of the only begotten of the Father, ) full of grace and truth. George mounted his horse, armed himself with the sign of the cross, and bravely went to meet the dragon as it came toward him. Brandishing his lance and commending himself to God, he dealt the beast [a deadly wound] . . ."Do not be afraid," he told [the people]. "The Lord has sent me to free you from the tyranny of the dragon. Only believe in Christ and be baptized, every one of you, and I will slay your dragon!" The beginning of the good news of Jesus Christ, the Son of God. As it is written in the prophet Isaiah, "See, I am sending my messenger ahead of you, who will prepare your way; the voice of one crying out in the wilderness: 'Prepare the way of the Lord, make his paths straight,'"